I look after my skin, I always have done. Having acne in my teens meant that I knew how important it was to make sure my face was clean, moisturized and protected, so I have carried that on through my adult life. My face has suffered with breakouts throughout different stages of my life, and hormones were always to blame – go figure! I always clean my face with a wash and a muslin cloth, and remove eye make up with an oily remover so I don’t have to rub them too hard. I use Harley Street Skin ‘Restorative Miracle Serum’, Anne Semonin ‘Miracle Eye Contour’ cream (who doesn’t want miracles to happen eh?) and Liz Earle’s ’Superskin Moisturiser’ every morning and night. My make up bag is filled to overflowing with lots of things that I have ‘just in case’, but there are a few essentials in there that I couldn’t do without. I use IT ‘Bye Bye Under Eye’ concealer, it’s perfect for slightly older skin that needs something that covers but doesn’t cake in the wrinkles. 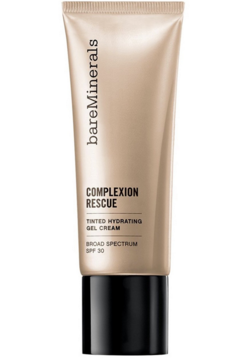 I use Bare Minerals ‘Complexion Rescue’ tinted hydrating gel cream with 30SPF. I use a MAC eye palette that pretty much does everything, including eyebrows. Smashbox’ X-Rated Mascara’, MAC ‘Ladyblush’ cream blusher, and MAC ‘Patisserie’ lipstick.